This week, Kathy is sitting down for her annual chat with Carol Sulcoski! 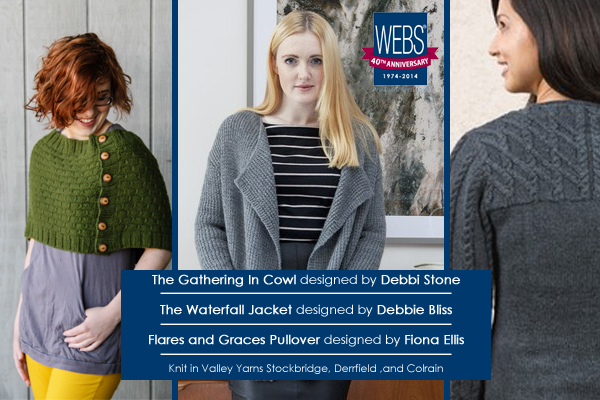 Carol is an author, teacher, and knitwear designer, and every year, she and Kathy get together to reflect on their favorite knitting trends of the past year. 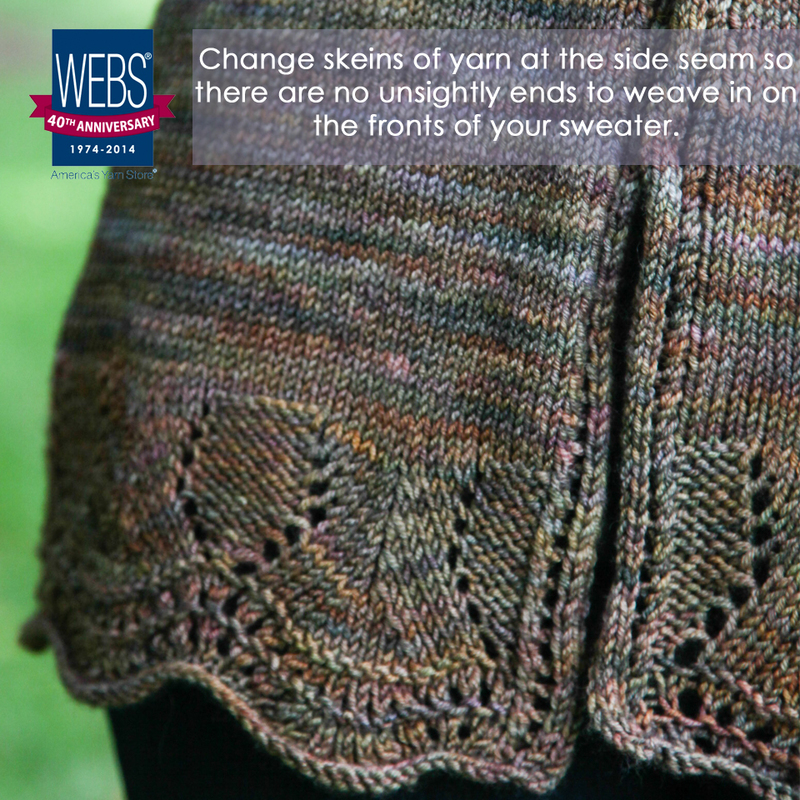 In 2017, it was all about gradient yarns and ombres, as well as more traditional Lopi and Icelandic knits. 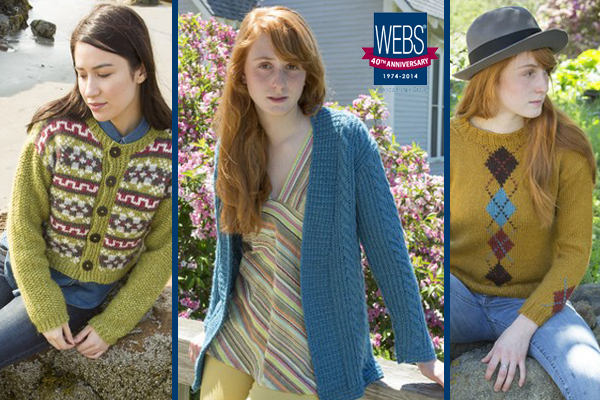 Listen to find out what their 2018 knitting predictions are! 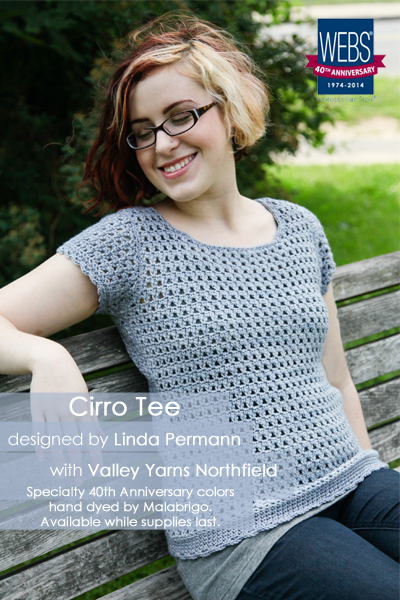 Year End Sale Yarns – Sale ends January 4th! We’ve teamed up with Northampton Brewery for Knit and Crochet Nites every Tuesday from 5:30 until 8! Come grab a beer or a refreshing drink, a snack, and spend some time with like minded crafters! We’ll have prizes and goodies, so don’t miss out! We’ll be back on January 9th! 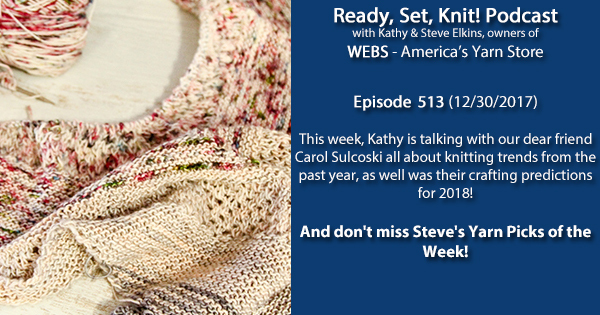 This week Kathy talks with Carol Sulcoski, it’s their annual Year in Review! 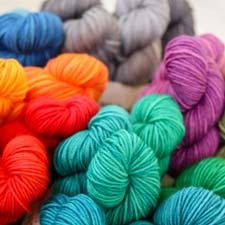 It was a year of constant change in the industry with some large yarn companies reorganizing, lots of beloved shops closing and new shops opening. 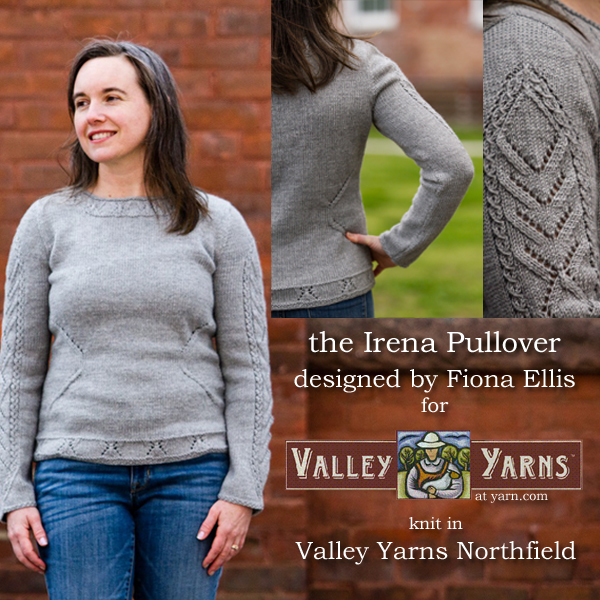 Knitter’s Review closing its forums and Mason Dixon Knitting reemerging. Lots of designers launched their own yarn lines, designers and teachers talked honestly about a Fair Fiber Wage and the Craft Industry Alliance was born. 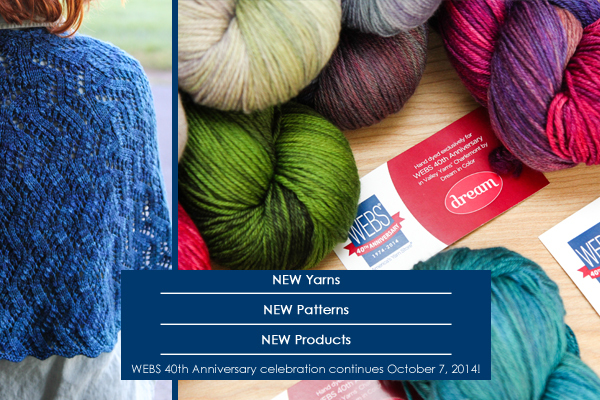 Cowls are still the go-to project with Gradient yarns being a favorite color trend this year. What was news to you? 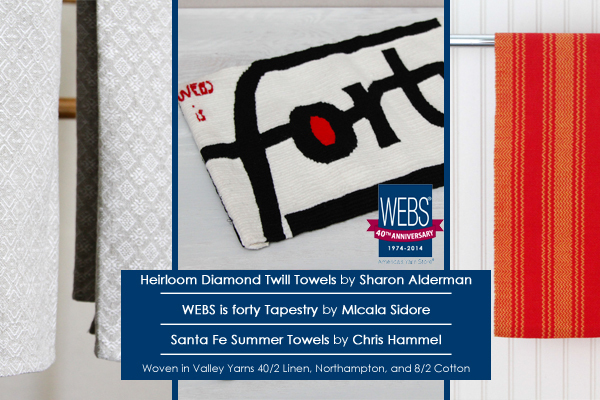 What trends and happenings did you see this year? Tell us in the comments! Year End Sale – Newly extended to January 4th! WEBS will be closing today at 4pm, and will be closed tomorrow. Red Cross Blood Drive at the store on January 12th! 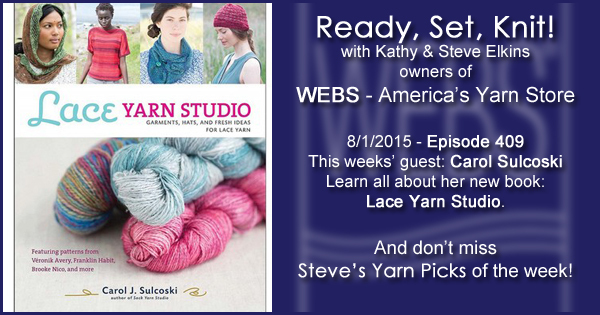 This week Kathy talks with Carol Sulcoski about her newest book Lace Yarn Studio, a wonderful collection of patterns, from some of the best designers in the business, that celebrates using lace weight yarn for more than just lace knitting. 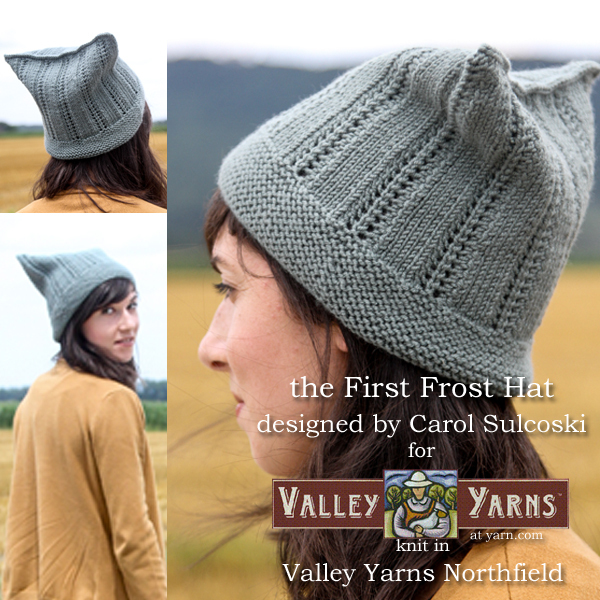 Be sure to check out Carol’s other books, patterns, her line of yarn and fiber, and her teaching schedule at Black Bunny Fibers. 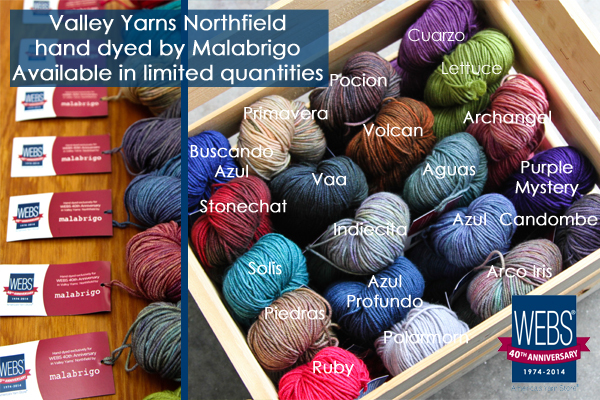 Malabrigo Mora – available soon! Stitches Midwest happens next weekend, August 6-9. 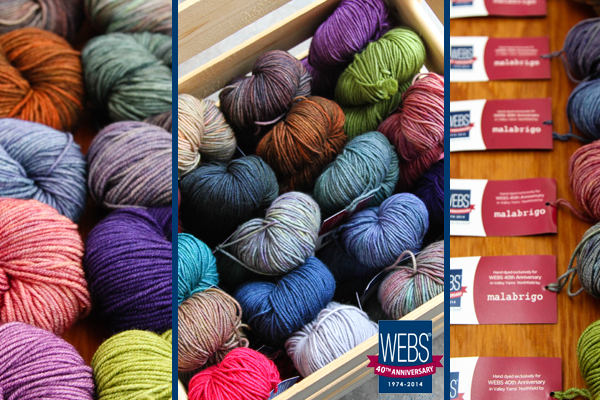 WEBS will be there and you can save 50% on admission with a coupon from us. Bathroom renovations are happening in our retail store starting August 23rd. Please plan ahead for restroom stops before and after your visit to help alleviate lines for our customers and staff. 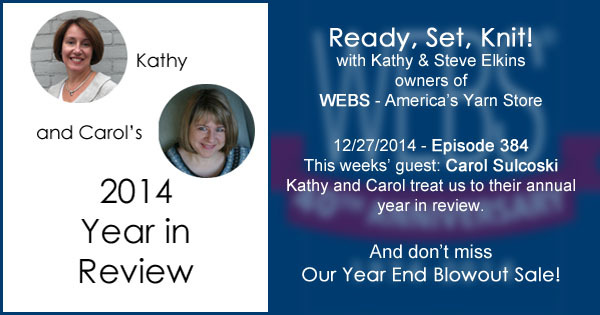 This week it’s time for Kathy and Carol‘s Year in Review! 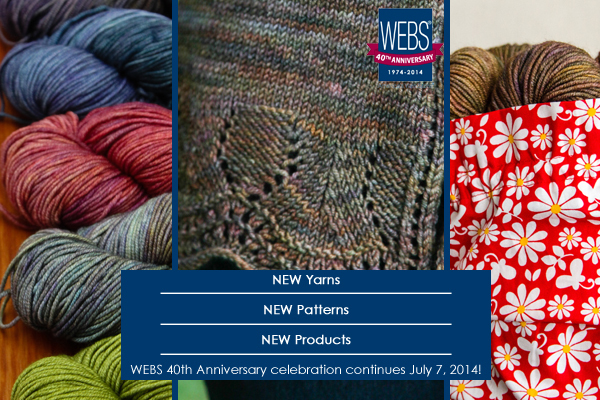 They discuss new yarns, consumer yarn shows and fiber festivals, online classes, the closing of some local yarn shops, new yarn businesses, what folks are knitting and more. 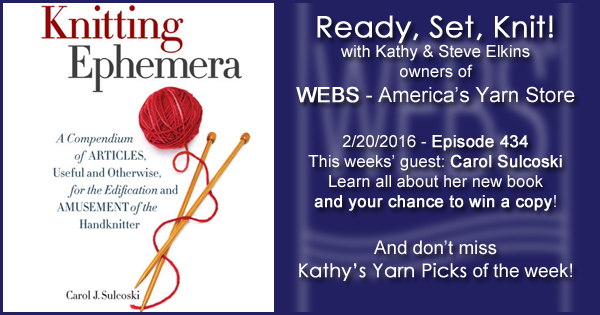 Ready, Set, Knit will return on January 10th with guest – Kate Atherley! Drop-ins will return the first full week of January. Winter/Spring 2015 Classes are on the website now, register before they fill up! WEBS will be open on New Year’s Eve until 4pm and will be closed New Year’s Day. Check all our holiday hours here. The Year End Blowout Sale is currently running through Jan. 3rd. 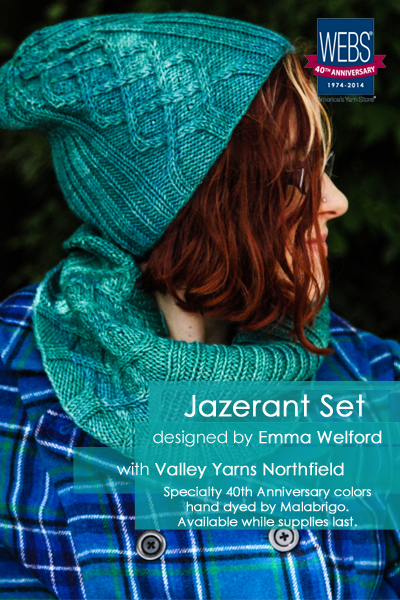 As with each of our previous specialty hand dyed yarns, we have three amazing designs to share with you that have been knit and crocheted in our Valley Yarns Northfield hand dyed by Malabrigo. 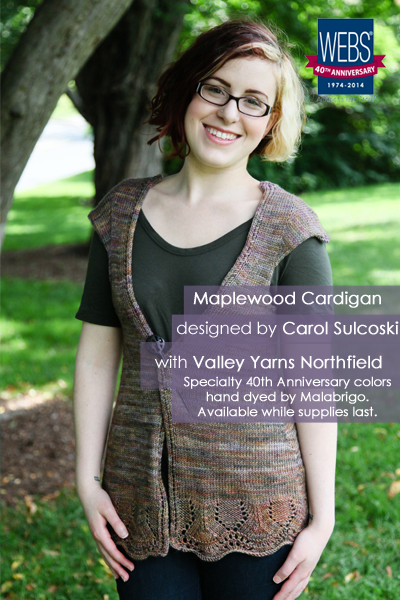 First up is the Maplewood Cardigan designed by Carol Sulcoski. 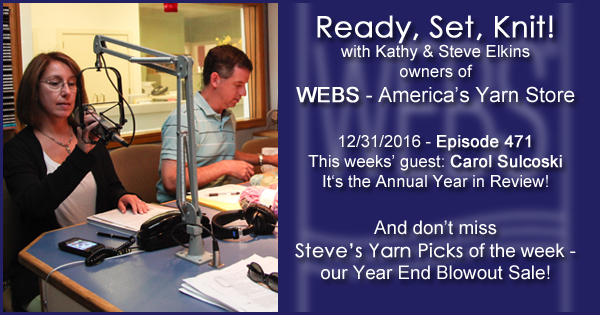 This week Kathy talks with Carol Sulcoski of Black Bunny Fibers about her design for our 40th Anniversary. 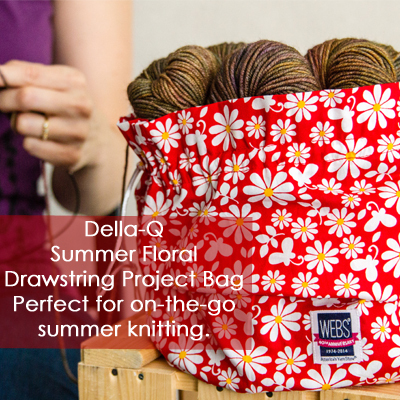 Here’s a sneak peak at our 3rd Quarter Anniversary Products – they officially launch on Monday July 7th! 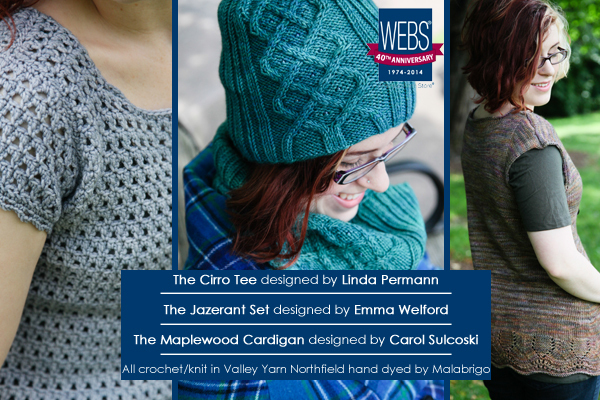 This quarter we have a knit cardigan from Carol, a crochet t-shirt from Linda Permann, and a cable and beaded accessory set from Emma Welford. Be sure to check the website on Monday to see these exciting new designs!